This program is designed to focus on appropriate interaction with other canines, including both structured and unstructured quality playtime. Socialization will help build confidence, social skills and acceptance while buring off energy. Screening will be done to ensure your canine will be able to interact appropriately. Sessions are 60 minutes in length, with pre-enrollment and/or drop-ins welcome. PUPPY SOCIALIZATION - Increase your puppy's motivation, confidence and willingness to learn appropriate play behavior using positive shaping techniques and through social interaction with other puppies and canines. Open to puppies 8 weeks of age and up. The sensitive period is 7 weeks to 14-16 weeks. It is equally critical to socialize the dog with other canines (all ages and sizes) in a well-managed facility with knowledgeable and experienced personnel. In the latest studies (Cornell and Guelph, last 3 years), it is been found that well-managed socialization and exposure of puppies to canines of all sizes will play a very positive role in shaping the puppy to be receptive and accepting of different canines and minimize behavior problems down the road. 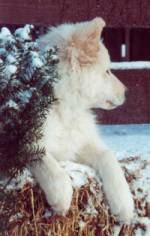 This period is when puppies learn: how to recognize and interpret canine body language, soft bite, soft and not-so-soft play, and other mirrored behaviors from their peers. However, it is important that the staff managing the "critical" puppies have knowledge and full comprehension of applied canine learning behavior and complete and full understanding of canine body language. Leave your puppy with a facility that understands the complexities of canine body language and learning behaviors. Expect to participate and interact during the dog's play time. It is a learning experience for all. 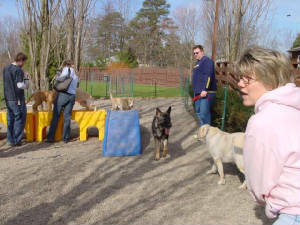 ADULT SOCIALIZATION - Increase your canine's motivation and confidence, helping him to relax and interact with other dogs appropriately in an controlled environment, while burning off energy. Saturdays & Sundays 9am to 10am. Other hours available upon request with or without other dogs.